Bhabha atomic Research Centre, Mumbai, I ndia. Received March 28th, 2011; revised May 3rd, 2011; accepted May 13th, 2011. 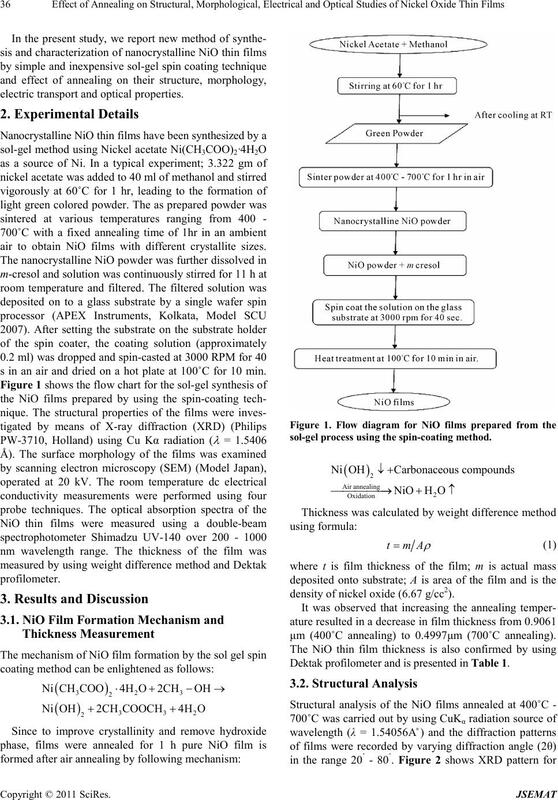 NiO films from 400˚C - 700˚C. These mean that the optica l qu ality of NiO films is impro v e d by annealing. tion of NiO-based nanosystems [ 7,8]. electric transport and optic a l proper tie s.
air to obtain NiO films with different crystallite sizes. s in an air and dried on a hot plate at 100˚C for 10 min. sol-g el pro cess using the spin-coating method. densi ty of nickel oxide (6.67 g/cc2). μm (400˚C annealing) to 0.4997μm (700˚C annealing). Dektak profilometer and is presented in Table 1. Table 1. 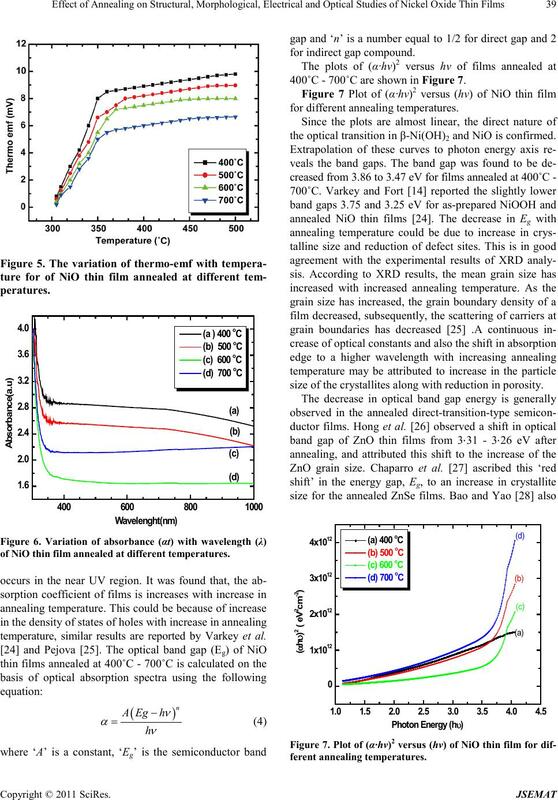 Effect of annealing on NiO thin film properties. revealing a fine nanocrystalline grain structure (Table 1). Figure 3. 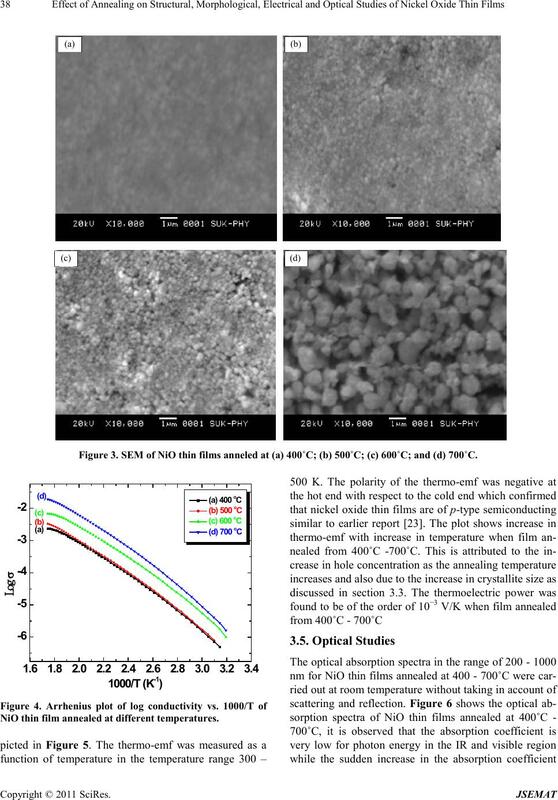 S EM of N iO thin films annel ed at (a) 400˚C; (b) 500˚C; (c) 600˚C; and (d) 700˚C. NiO thin film anneal ed at different temperatures. of NiO thin f ilm annealed at different temperatures. temperature, similar results are reported by Varkey et al. 400˚C - 700˚C are s hown in Figure 7.
the optical transition in β-Ni(OH)2 and NiO is co nfir med. size of the crystal lite s along with red uction in por os i ty. ferent ann eal ing temperatures. 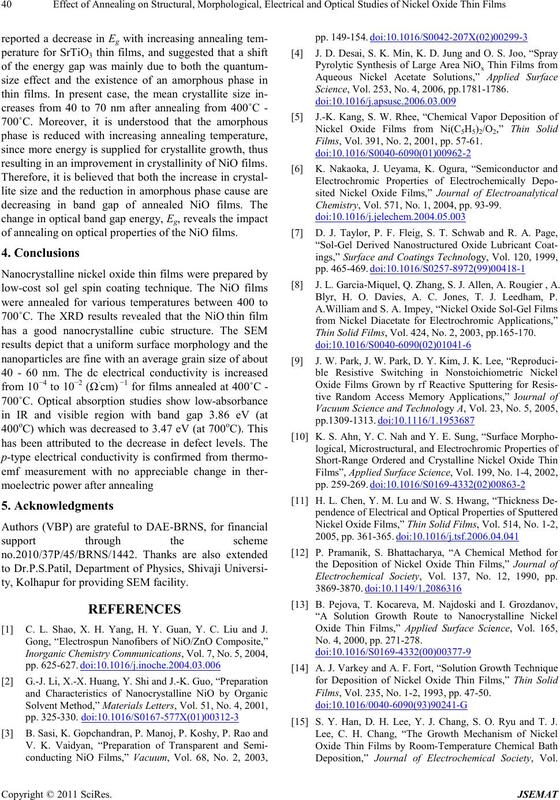 resul ti n g i n an i mpr o ve me nt i n crysta llinit y o f N iO fi l ms .
of annealing on optical properties of the NiO films. ty, Kolhapur fo r providi ng S EM fa cility. C. L. Shao, X. H. Yang, H. Y. Guan, Y. C. Liu and J.
Scien ce, Vol. 253, No. 4, 2006, pp.1781-1786. Films, Vol. 391, No. 2, 20 01 , pp. 57-61. Chemistry, Vol. 571, No. 1, 2004, pp. 93-99. J. L. Garcia-Miquel, Q. Zhang, S. J. Allen, A. Rougier , A.
Blyr, H. O. Davies, A. C. Jones, T. J. Leedham, P.
Thin Solid Films, Vol. 424, No. 2, 2003, pp.165-170. Electrochemical Society, Vol. 137, No. 12, 1990, pp. No. 4, 2000, pp. 271-278. Films, Vol. 235, No. 1-2, 1993, pp. 47-50. 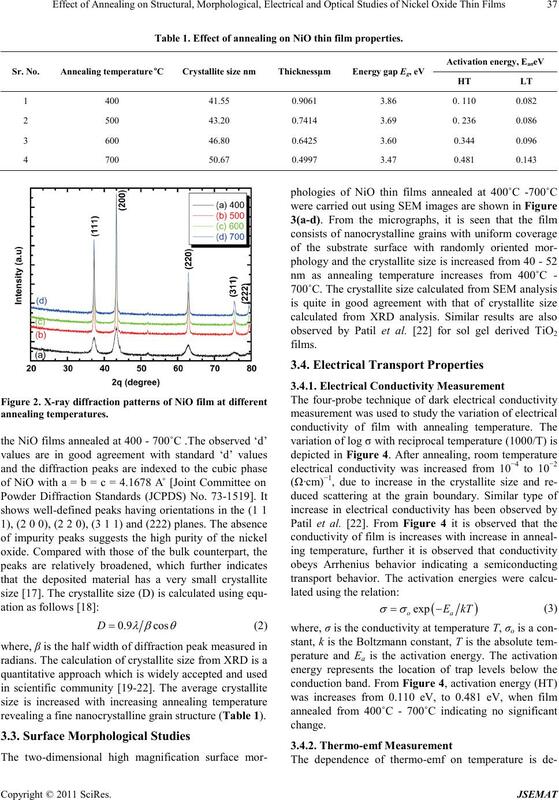 S. Y. Han, D. H. Lee, Y. J. Chang, S. O. Ryu and T. J.
Deposition,” Journal of Electrochem ical Society, Vol. 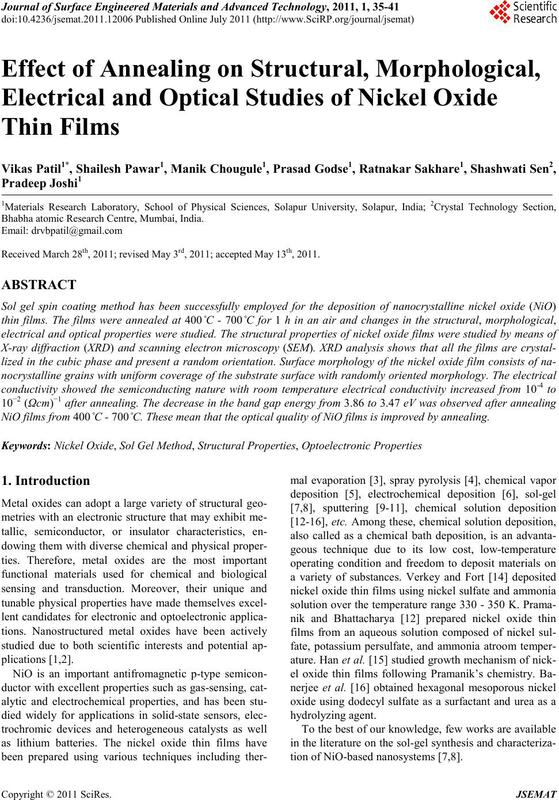 S. Banerjee, A. Santhanam, A. Dhathathrenyan and M.
Nickel Oxide,” Langmuir , Vol. 19, No. 13, 2003, pp. E. Comini, G. Faglia, G. Sberveglieri, Z. Pan and Z. L.
Letters, Vol. 81, 2002, pp.1869-1871. Vol. 84, No. 4, 1998, pp. 2287-2280. C. N. R. Rao, S. R. C. Vivekchand, K. Biswas and A.
Dal ton Tr ansactions, Vol. 3 4, 20 07, pp. 3728-3749. Electronics, Vol. 22, No. 3, 2011, pp.260-264. Chemistry of Solids, Vol. 57, No. 1, 1996, pp. 81-84. Scien ce, Vol. 242, N o. 3-4, 2005, pp. 346-352. 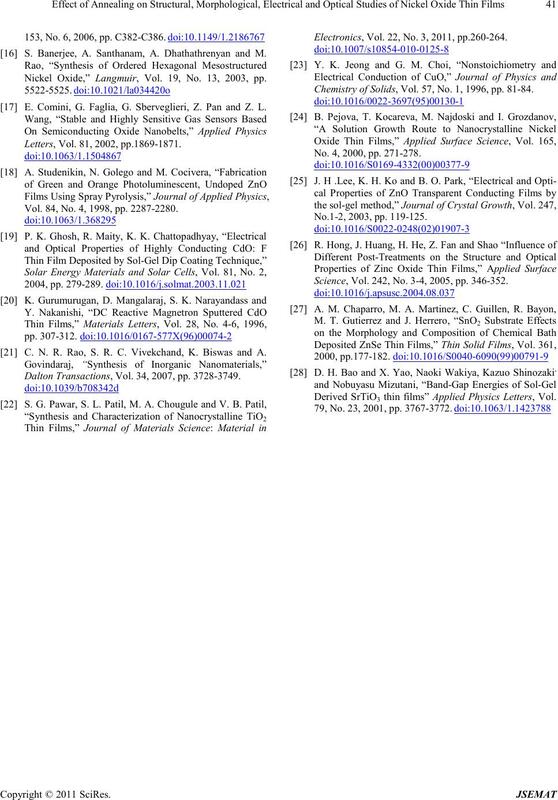 Derived SrTiO3 thin films” Applied Physics Letters, Vol.